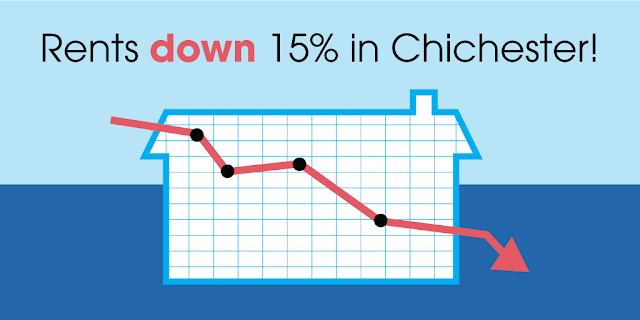 Chichester Property News: Rents down 15% in Chichester! Rents down 15% in Chichester! That’s a shocking title, but it’s true; the average rental price for a property on the market in Chichester is £975pcm. A year ago it was £1,150pcm. 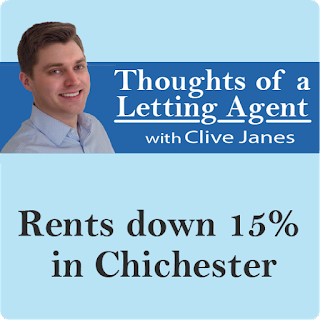 What’s fuelling this drop is quite simple - an imbalance in the supply and demand of rental properties in Chichester. On the supply side there are 199 properties on the rental market as I write. 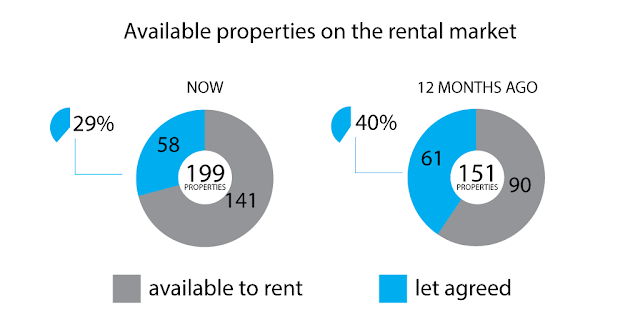 141 are available to rent whilst 58 are let agreed (29% of the total). 12 months ago there were just 151 properties in Chichester’s rental market; 90 of these were available to rent, whilst 61 were let agreed (a far greater 40% of the total). So, there were more properties let agreed a year ago than there are now…and yet there are 32% more properties on the market! This shows that on the demand side there are simply fewer tenants taking up tenancies right now than there were a year ago. It’s easy to roll out the all-encompassing excuse that is ‘Brexit’ for the market slowdown, but perhaps it’s just that tenants are more settled in their homes. Maybe they’re waiting for tenant admin fees to be banned before moving. Is job security weaker than it once was, thus forcing people to ‘hunker down’? No one knows for sure…but the simple fact is that there are more properties available to rent in Chichester and fewer being let…and that can only lead to lower prices. I do think that late 2017 was something of an oddity here in Chichester though - supply had been unusually low for a long time, which had led to rents rising. If we go back a few years the average rent was lower than it is now (£925pcm) and whilst there were still fewer properties on the market than there are now (168), the percentage let agreed (29%) was identical to what we’re seeing today. It also stands to reason that if there are more cheaper properties on the market then the average price will naturally be lower. I think there’s an element of that here, as the average a year ago (£1,150pcm) sat much closer to the price of an average three-bedroom house (£1,200pcm) than it did the price of a two-bedroom house (£950pcm), whereas today the average rent (£975pcm) sits closer to the price of a two-bedroom house (£950pcm) than today’s three-bedroom houses (£1,150pcm). Consider also that whilst the price of one-bedroom flats and three-bedroom houses have indeed dropped, the price of the average two-bedroom house has remained the same whilst the price of two-bedroom flats and four-bedroom houses have actually increased. So, whilst landlords with properties currently available to rent need to be aware of an increased supply to the market, I do not feel it is time to panic; doing so by slashing asking rents would only fuel a further fall in prices.